One of the many things we love about our home is having a laundry and mud room off the kitchen. When we closed on the house, our first purchase was a washer and dryer. We moved in, had them installed and the room has stayed practically untouched with it's cream colored walls, faux wood vinyl flooring and three large windows for the last eleven months. There was absolutely no storage, unless you count the floor. Cleaning supplies, laundry, and shoes would pile up in the room creating a clutter of tripping hazards. With back to school and wet shoe/boot season upon us, I wanted to organize the space as quickly as possible to alleviate some of the stress that came with all of the clutter. Part of the organization would come from building some much needed storage. Although we didn't create a formal budget, we knew we had a couple larger projects planned in the near future so we wanted to keep the renovation as cost effective as possible. Another thing we considered was the return on investment. Would a laundry and mud room makeover make a big impact and add value to the home? The short answer was no. 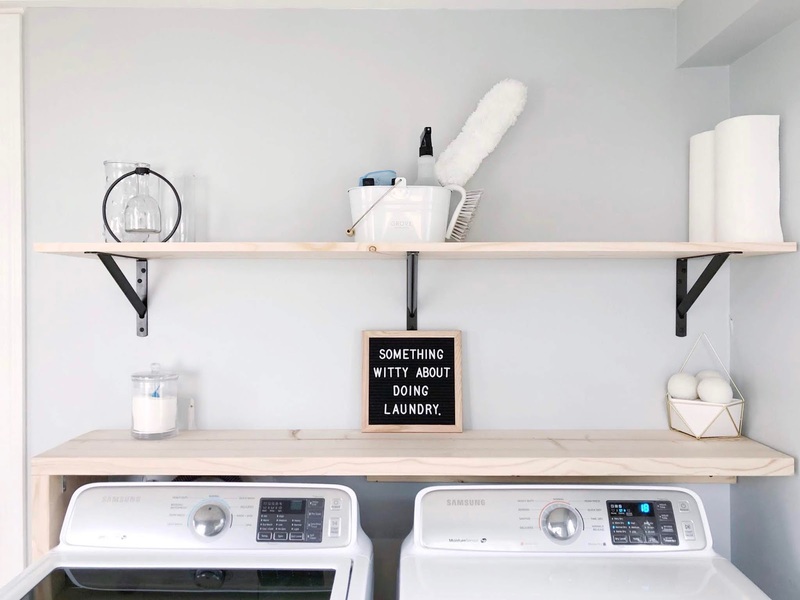 Sure, it's a whole hell of a lot better than a laundry room in a dark and damp basement but the space is more function than aesthetics for most people. When we renovated the living room this past winter we loved the wall color so much that we ordered 5-gallons of it. Risky? Yes. Worth it? Definitely. We have since used the paint in the second floor hallway, have plans to use it in our master bedroom when the time comes and now, we planned to use it in the laundry room. It saved us so much time from having to pick out a new color and even some money since we had previously spent it on the 5-gallons. The next thing to get an upgrade was the flush mount light fixture. We kept with the running theme of antique bronze and black fixtures throughout the first floor and went with the same sculptural glass globe that is installed in both the front entryway and main floor hall. The last thing to be decided on was the storage. We needed enough storage for laundry, cleaning supplies and a few other home items. In fact it was so last minute that we were up Friday night finalizing plans for the Saturday morning project. We wanted something clean, modern and minimalist and I am pretty confident that we nailed it with those design goals. We are beyond happy with how the project turned out and can't believe how such an inexpensive project could make the impact in the space that it does. Since sharing several peeks on social media we have gotten so many questions about the project budget so I laid it all out below.